I love your pins! How could I not have those in my pin collections yet! Cute monorail pins! We picked some of the monorail pins up in a lot for trading next trip, but I'm not sure we want to trade the monorail pins as it's a family favorite ride. "Please stand clear of the doors. Por favor manténganse alejado de las puertas." Oh cool, we have some monorail ones, but hadn't seen the boat ones. Thanks for sharing! 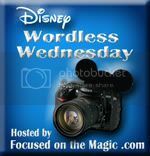 That was a fun way to capture the theme this week! Great idea KJ- I bet that Segway pin is worth something!! It just may be! So sad that this tour isn't offered anymore. It was one of my all-time WDW highlights. So creative! 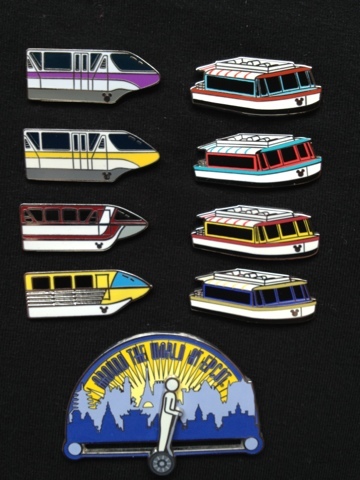 Need to have a monorail in my pin collection! DisTransPins. LOVE THIS ONE! Cute pins and great take on this week's theme. Love the Segway! Adorable! A great way to do this week's theme. Very creative! What a great collection! Your take on the theme is so creative! I've never seen the boats or the Segway pin before. My son has a few of the monorails. I'm going to have to start him on the boats! Thanks so much for sharing! The Segway pin was not available for purchase- it was given to participants upon completion of the Around the World Segway tour at Epcot. Sadly, they stopped offering the tour last year. Great take on the transportation theme. I've never seen the segway before and I love that one. Awesome collection! What a fun collection!! The kiddos would be jealous! Are those pins I see? Very cool! !